“No,” I whisper to her, gentle, then turn back to the picture emerging from the canvas. These coincidental accidents bring beauty to not only art, but to art studios themselves, I think and that’s so true of humanity too, how so often it’s the differences that give vibrancy to an otherwise dull world. So she sits there, watches me paint, watches the way I dip the brush, watches how a stroke of green merges with blue and the waves of an ocean take shape. The paint brush, fallen, lies on the floor, a puddle of blue drying beneath it. The day in the emergency room is over and I’m sitting in my chair, drinking coffee and I open the news app. My breath catches, bitter bile rises. My coffee sits cooling as I read. So many dead. So many wounded. Oh, Orlando, I’m praying for you. I close my eyes, lean back, sigh deep. I remember her well, the way I met her in the ambulance bay and she couldn’t get out of her car, couldn’t catch her breath because she was crying so hard. Her partner’s panicked face met mine and we struggled together, her and I, to get her into a wheelchair, into a room and I placed a bag around her mouth, rubbed her shoulder and told her, “Breathe with me, slow and steady, in, then out…” Because that’s all you can do when hatred pours raw and ugly down around you and the darkness closes in; you reach toward the few who love and just breathe together. She slumps against her partner, wipes the tears against the sleeve of her shirt. “We just told everyone about our relationship,” her partner explains. I offer her a tissue, squirm in my chair. I go back to my desk, close my eyes, breathe deeply because the patient in the room next door who just swore at me has their call light on again and I’m suddenly weary from trying to heal all the hurting in the world. Love. Just love. You don’t have to understand. I stand, go into the room and I’m thinking of another Man who came to earth and loved the prostitute at the well, how He ate dinner with the embezzling tax-collector, how He loved a murderer as they hung on the cross together in pain… how He left such a powerful witness to how we should truly live and love. “What the **** happened to me?” the man asks lying on the cot. “Am I going to bleed to death?” he slurs. The Band-Aid on his head covers the already clotted off head wound. It’s true. 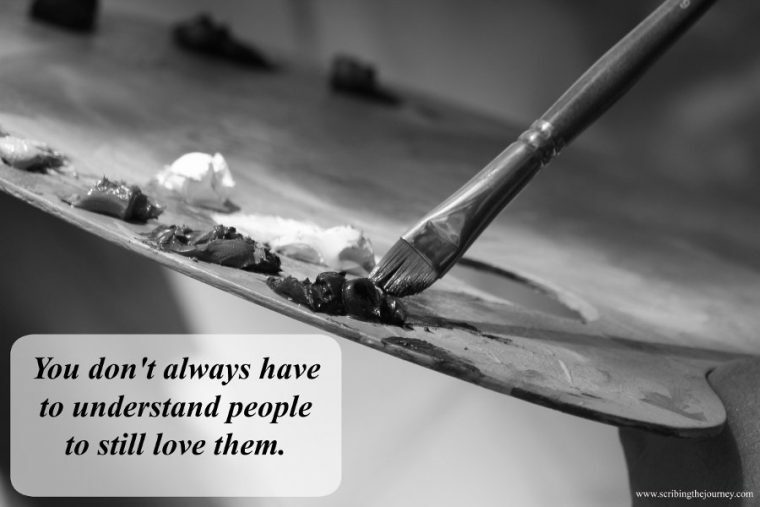 You don’t always have to understand to still love.